Heavy Machinery (Tucker Knight & Otis Dozovic) battled Forgotten Sons (Steve Cutler, Jaxson Ryker, Wesley Blake) tonight on NXT. Jaxson Ryker was ringside for the match. Knight and Cutler started off the match. Steve took control and tagged Blake into the match. Cutler tagged back in and Knight took him out with a Crossbody. Otis tagged in and slammed Cutler on top of Blake. Otis hit Cutler with a Splash in the corner of the ring and followed it up with an Elbow Drop. Dozovic knocked Blake off the ring apron but Cutler capitalized on the distraction by slamming Otis to the canvas. Blake tagged in and hit a Knee Drop for a near fall. Blake followed it up with a massive Clothesline and then tagged Cutler back into the match. Cutler stomped on Otis’ shoulder several times for a two count. Blake got back and hit a Leg Drop on Otis’ injured shoulder for a near fall. Blake then applied an Arm Bar in the middle of the ring as Otis screamed in pain. Blake transitioned into a Triangle but Otis showed off his strength and broke the hold with a Powerbomb. Cutler tagged in and Otis finally was able to tag out. Knight hit Cutler with a big boot and then Clotheslined Blake to the outside. Tucker stomped on Cutler in the corner of the ring and followed it up with a Splash. Knight climbed to the top rope and hit Cutler with a Cannonball for a near fall. Blake tagged in and Cutler hit Knight with a Backstabber. Blake followed it up with an Elbow Drop off the top for a near fall. Blake perched Knight on the top rope and tagged Cutler back in. Cutler connected with a Superplex and Blake followed it up with a Splash off the top. Blake went for the cover but Otis broke it up at the last second. Otis launched Blake out of the ring and then got launched to the outside by Cutler. Knight went for a roll-up but Cutler kicked out. Tucker connected with a Clothesline and tagged Otis back in. Blake took out Knight as Cutler planted Otis with a Backstabber. Blake tagged in as Knight launched Cutler onto Ryker outside the ring. Otis then hit a Pop-Up Slam on Blake for the pinfall victory.
.@WWEDozovic getting it done! ? 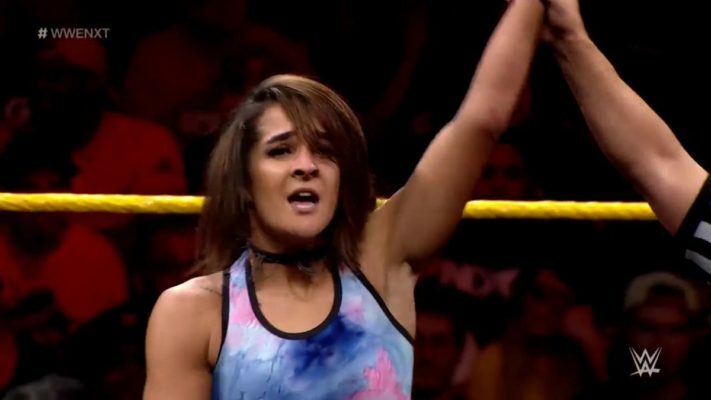 Dakota Kai faced Taynara Conti on this week’s episode of NXT. Conti slammed Kai to the mat and shouted “are you crazy?” at her. Dakota caught her attempt at a kick and connected with an Arm Drag. Kai followed it up with a Dropkick for a one count. Kai rolled up Conti for a near fall and then locked in an Arm Bar. Taynara broke free and slammed Kai into the turnbuckle. Conti unloaded several kicks on Dakota and went for the cover but Kai kicked out at two. Conti tossed Kai and then delivered a kick to her face for another near fall. Conti got pissed off that Dakota kicked out and applied a Wrist Lock. Conti missed with a Splash in the corner and turned around into a kick from Dakota. Kai hit a flurry of kicks and then a big boot to Taynara’s face. Dakota followed it up with two Facewash Kicks and then a Chiropractor (Backstabber) for the pinfall victory. Johnny Gargano sent in a video to NXT to explain why he attacked Aleister Black. Gargano said that he was on a path to right a wrong and to defeat Tommaso Ciampa for the NXT Championship. Johnny accused Black of getting in the way and that it was nothing personal. Gargano claimed that he will be the hero at the end of this story. Johnny added that he still fights for what is right but sometimes you have to fight a little dirty. Johnny admitted that he accepts that Black wants to kick his face off but isn’t scared of him. Gargano noted that he is not afraid of the dark anymore and is kind of starting to like it. Johnny then took a seat in the same spot he left Black laying. 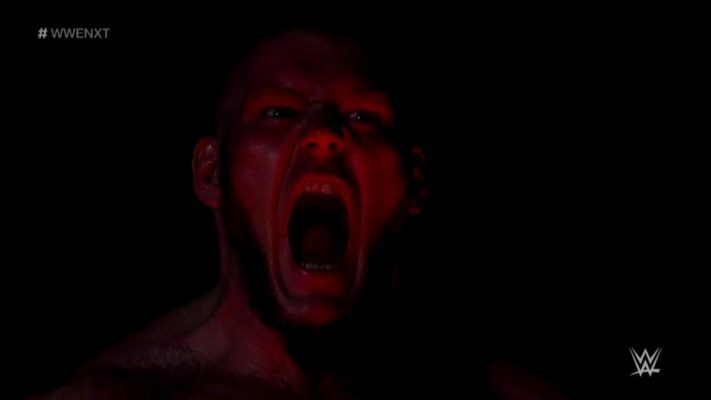 Johnny vowed to leave Black laying once again at NXT TakeOver: WarGames. 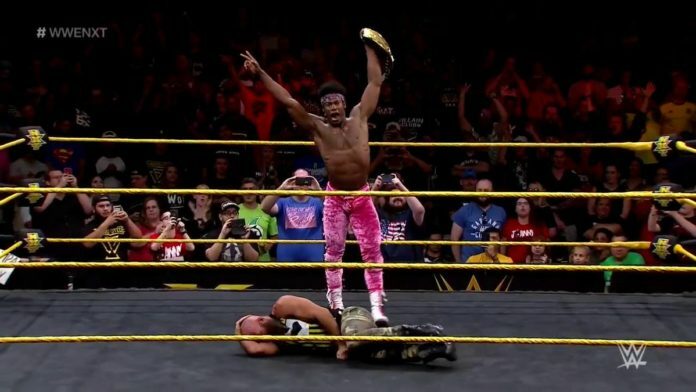 Velveteen Dream squared off against Lars Sullivan in the main event of this week’s show. Sullivan drove Dream to the corner to start off the match and then launched him across the ring with ease. Dream connected with a shoulder tackle that knocked Sullivan to the outside and then shoved him into the steel steps. Dream bounced Lars’ face off the steps and then tried to get back into the ring. Lars brought Dream to the outside and slammed him into the ring apron. Back in the ring, Sullivan threw Dream across the ring and followed it up by slamming Velveteen’s face into the mat. Sullivan hit a massive right hand to Dream’s face and then a giant Clothesline for a two count. Lars launched Dream out of the ring and then posed in the ring. Dream battled back with a Dropkick off the top rope for a near fall. Lars hit a huge Powerslam for a near fall as the crowd chanted “Velveteen!”. Sullivan climbed to the top rope but Dream hit him with a Superkick. Dream slammed Sullivan into the ring post and then hit the Dream Valley Driver on Sullivan. NXT Champion Tommaso Ciampa came down the entrance ramp and Dream hit him with a Crossbody off the top rope. Lars Sullivan capitalized on the distraction and hit Dream with the Freak Accident for the pinfall victory. Tommaso Ciampa attacked Velveteen Dream after the match and shouted that Dream wasn’t in his league. Dream battled back with a Superkick and hit a DDT onto the NXT Championship. Velveteen Dream climbed to the top rope but a bunch of referees came into the ring to prevent Dream from hitting the Purple Rainmaker Elbow Drop. Dream hopped down and then quickly hopped back up to the top rope and hit the Rainmaker Elbow Drop on Ciampa. Dream then posed with the NXT Championship as the crowd chanted “Velveteen!” to close the show. A member from the two teams competing in the WarGames match at TakeOver will battle next week. The winner of the match next week will earn the 2 vs. 1 advantage in the early stages of the WarGames match at NXT TakeOver.